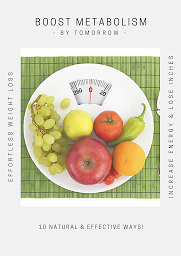 You can enjoy pizza night with your family while feeling good about what you are serving with these simple steps to help balance your plate. I’m not going to lie, I look forward to pizza night every week. It’s our Friday evening routine as we wrap up a hectic week. 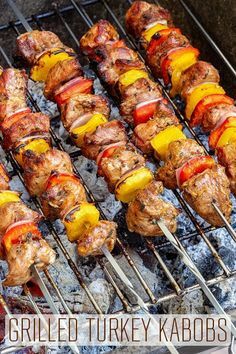 By the end of the week, I just don’t have the energy to cook an elaborate meal, and I want to serve something that I know will make everyone happy. Since pizza is a huge fan favorite over here (it was practically the baby’s first word! ), I know it will always be a hit. I used to be a little hesitant to admit that I served pizza so often, but the truth is when you balance out your meal, pizza can fit into a nutritious meal plan. 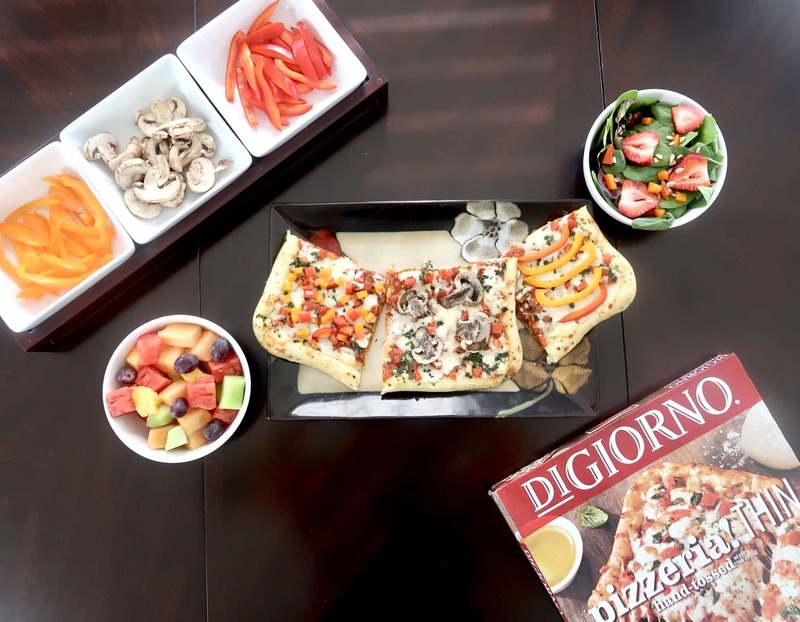 That’s why I have partnered with my friends over at Nestlé and DiGiorno to show how you can host a balanced family pizza night that you can feel good about. 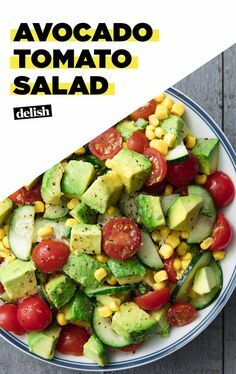 I’m all about showing you how to make time for health no matter how busy your day gets, and finding time to prep and prepare healthful meals for your whole family can be challenging. Sometimes, I just don’t have time to make something from scratch, and I’m sure you run into that same obstacle as well. 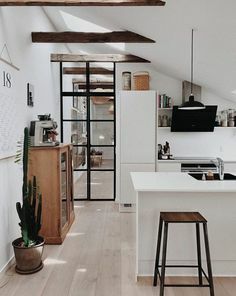 But no matter how busy the day gets, I try to make family dinners a priority since they are such a great way for us to all stay connected. That’s why I love the concept of Balance Your Plate. 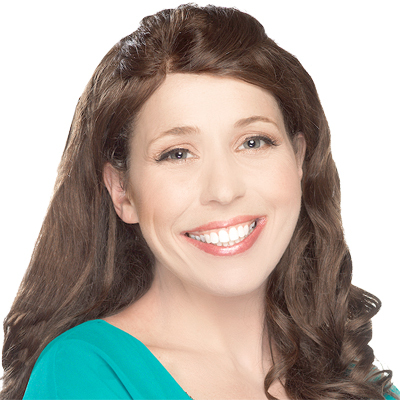 By pairing frozen options with other foods groups (hello fruits and vegetables!) you can have a well-balanced meal ready to go in no time. Balancing my family’s plate with this formula on pizza night has actually been a huge win. 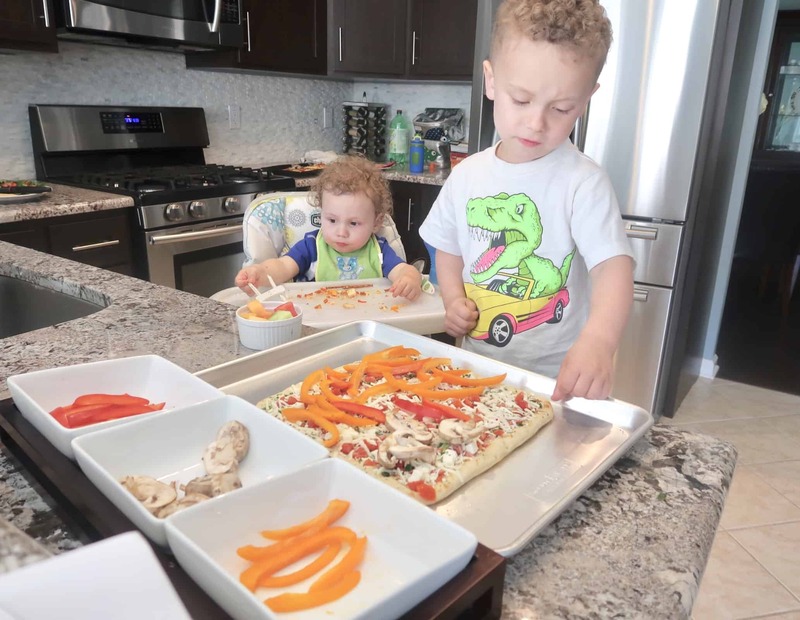 Adding the vegetable toppings bar has encouraged my boys to try new vegetables in different ways, which has led them to eat more vegetables all week long. I usually offer three vegetable topping options for our pizza including two favorites and one new offering. 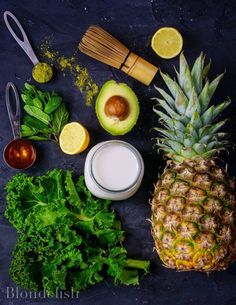 By balancing a favorite food (pizza) with a mix of familiar foods and new foods, I have found the boys have been much more accepting of each new vegetable introduced. This week’s toppings bar included red bell peppers and orange bell peppers (the current favorite vegetable) along with mushrooms (a vegetable they have been hesitant to try). 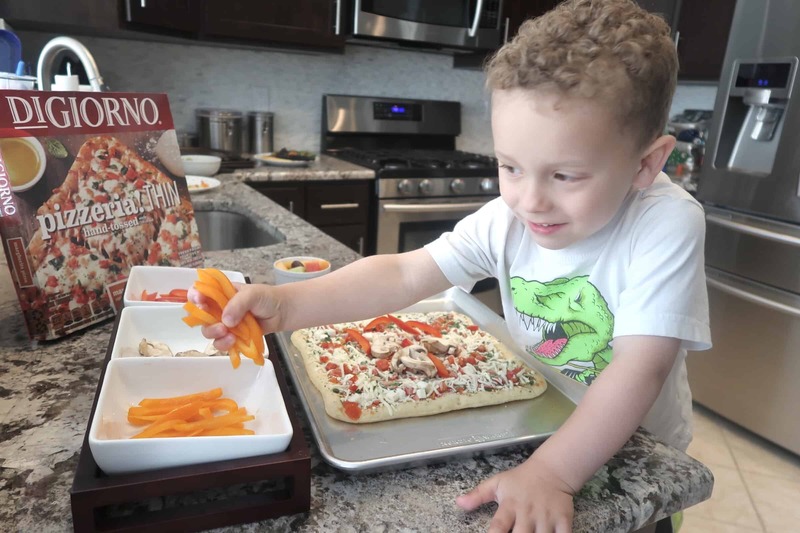 I then allow them to ‘decorate’ the DiGiorno pizza with any combination of vegetables they want before baking. As the pizza bakes, I have the boys help me prepare a fresh fruit salad as well as a garden salad. Our time together prepping our pizza has also been a great way to start the conversation of portion size and how to be mindful of how much we eat. When discussing how much pizza we should add to our plate, the visual reminder of using our own hand as a guide has been extremely helpful to my whole family. It’s such an easy (and convenient) guide. For pizza, aim for one hand’s worth as a regular meal portion (or two hands worth for a large meal on those super active days). Since a child’s hand is much smaller, this guide has also been helpful to me in understanding how much I should serve each of my boys. 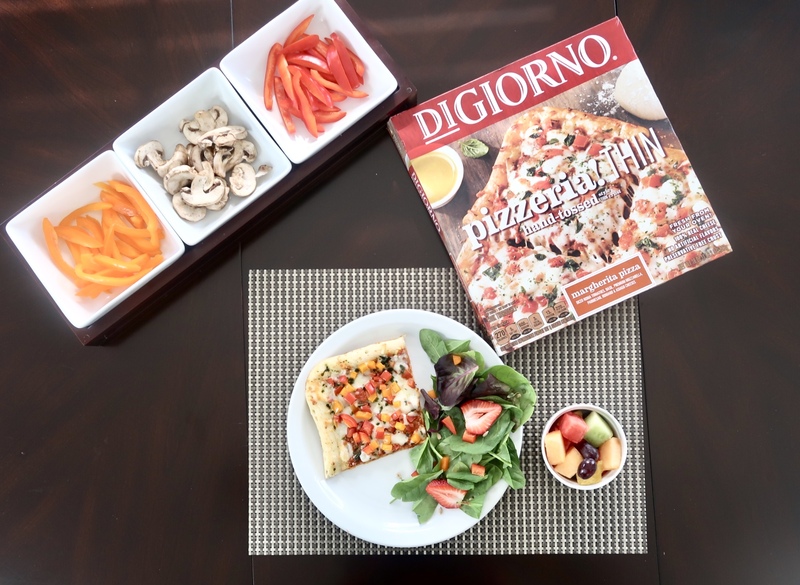 What I love about DiGiorno is that they include a Nutrition Compass right on the back of the box to help you determine a suggested portion and then build your dish from there. 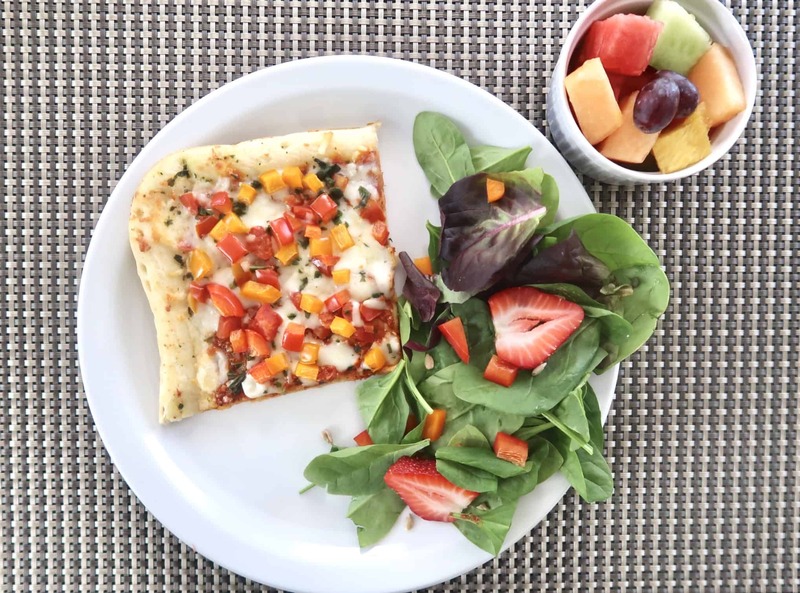 When the pizza is ready, we round out one portion of veggie-topped pizza with our fruit salad and garden salad for a balanced plate combo everyone is happy about. 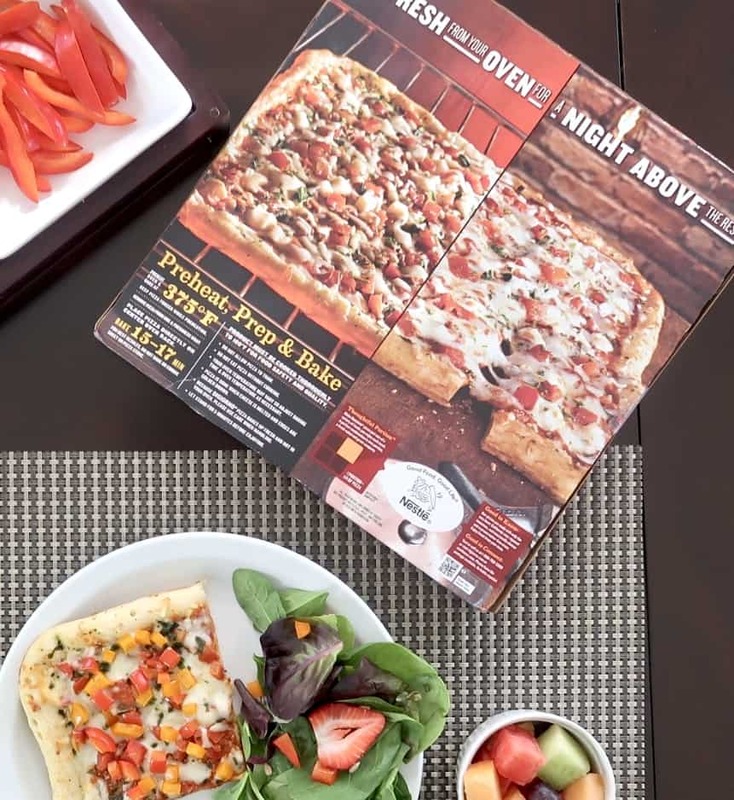 If you’d like more ideas on how to balance your family’s plate to make pizza night (or any other night) a tradition you can feel good about, visit the Balance Your Plate website at www.nestleusa.com/balance and Pinterest board at www.pinterest.com/balanceplate/ for more meal inspiration and ideas! 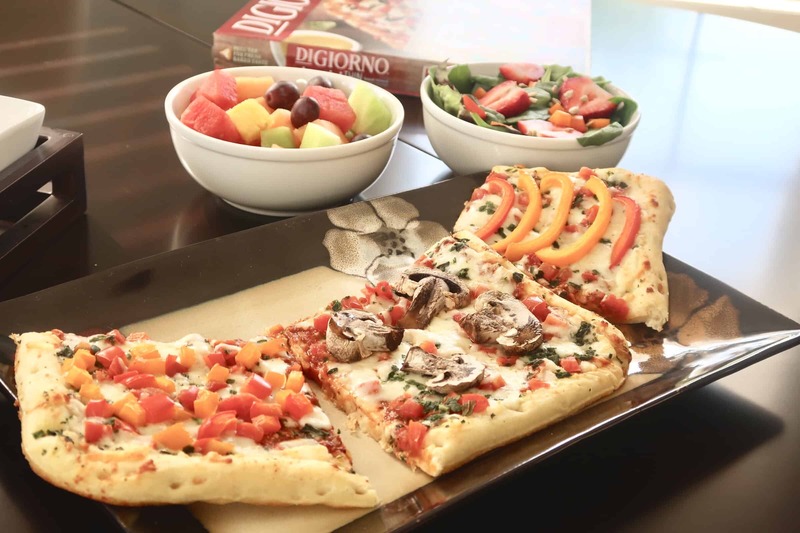 This post was created in partnership with Nestlé’s Balance Your Plate program and DiGiorno. I have been compensated for my time, however all opinions are my own.